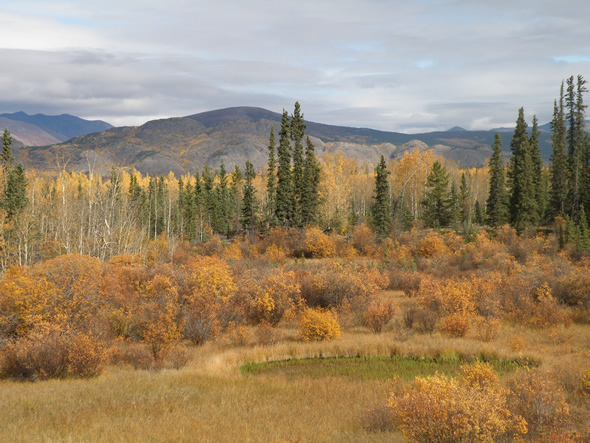 Welcome to October's issue of the Dereila Nature Inn newsletter. it changing colours and preparing us for the upcoming winter. Here we are with another issue of Whispers, the newsletter of the Dereila Nature Inn - your virtual nature centre. We'd like to welcome our new subscribers this month and we hope you'll all enjoy the trivia, photos, news and tips in this issue. We are grateful to those of you who have sent in ideas and contributions, and we appreciate everyone's support of our nature website. Many thanks to you all! Which is the only mammal that cannot jump? If you know the difference between a Common Whitetail and a Variable Darner, try this crossword with over a dozen different Dragonflies and Damselflies. We invite you to submit nature photographs to this section. 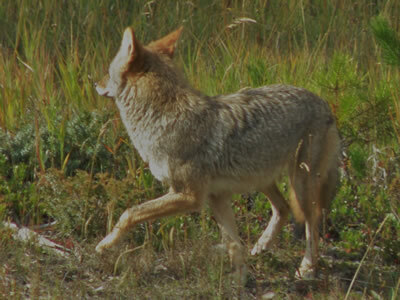 This month we have another super variety of wildlife images. 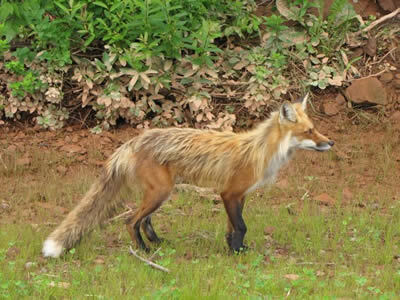 Red Fox, Vulpes vulpes, by Tony D. of Toronto, ON, taken in Prince Edward Island. 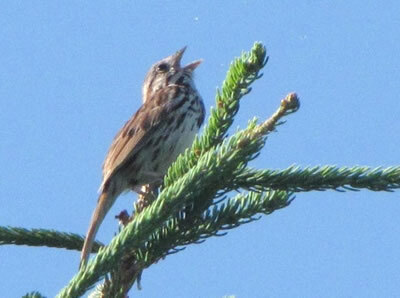 Singing Song Sparrow, Melospiza melodia, also by Tony D.
American Toad, Bufo americanus, from Susan Asis, Flushing, NY. Laura of South Edinburgh, Scotland. for taking the time to send them in to us. We really appreciate it. 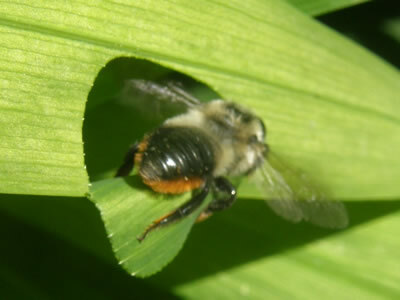 Bug - Bumblebee Robber Fly; Wildflower - Smooth Hawksbeard Lily; Bird - Sooty Grouse. We have created many At-A-Glance Guides over the past few years. These are visual guides with thumbnail images. Clicking on the thumbnail opens up a pop-up window with a larger photograph of the subject matter. This month's feature page is our At-A-Glance Guide to Butterflies. It features over three dozen different butterflies organized by family. Visit it by clicking here. while exploring the moist coastal rainforest. 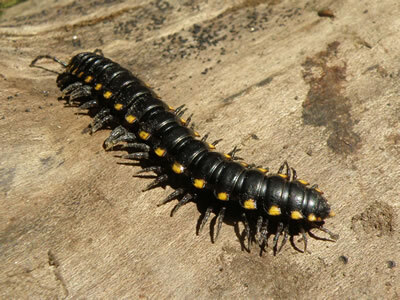 This is a Yellow-Spotted Millipede, Harpaphe haydeniana, which grows to about 2 in/5 cm long. 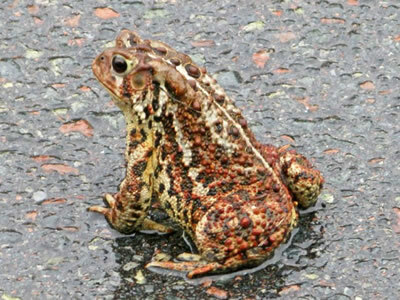 It is also called Cyanide Millepede beacuse of the fact that when threatened it has the interesting ability to secrete hydrogen cyanide! As a result, it has very few predators. Here's our monthly image ready for your humourous caption along with a couple of our ideas. 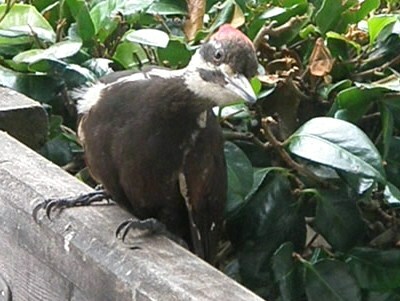 Just what do you think this Pileated Woodpecker is saying? Number one: "Yoohoo! Are you there?" Number two: "Hello! Where's my suet? It's lunch time!" 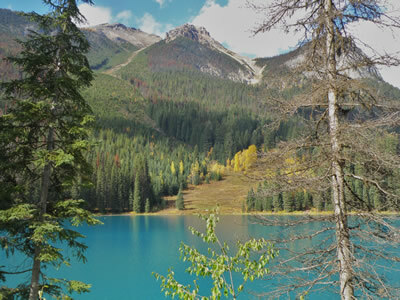 Nestled in Canada's stunning Yoho National Park in southeastern British Columbia is Emerald Lake. This is a truly special place of beauty especially with the surrounding mountains and dazzling colours of the water. There are hiking trails to explore and in the winter it's a great place for snowshoeing or cross-country skiing. 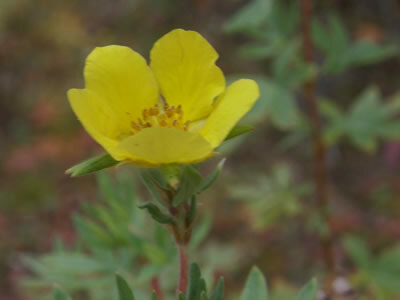 Shrubby Cinquefoil, Potentilla fruticosa, is a shrub with flowers that have 5 petals. The scientific genus name Potentilla, comes from a Latin word meaning powerful as it was believed to have healing properties. The species name, fruticosa, simply means shrubby. The common name is also derived from Latin words: quinque meaning five and folium meaning leaf. A drunk coyote was walking through the woods when he bumped into a tree. "Oh, I'm sorry," he said. A little further on he bumped into another tree. Then he sat down and thought to himself, I'd better sit here and wait until those fools pass by. "It's always the best thing to do." When you're cleaning up the garden in preparation for winter, be sure to leave a few plants with seed heads. 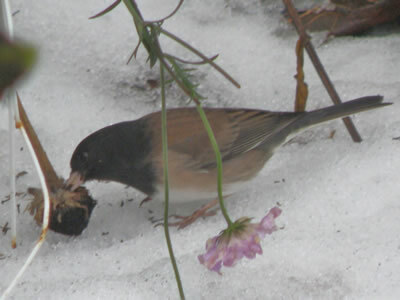 When the snows arrive, you'll find that the birds really appreciate the food as this junco did. It doesn't take much to create a natural scene for your photographs, simply by using a few of nature's props. 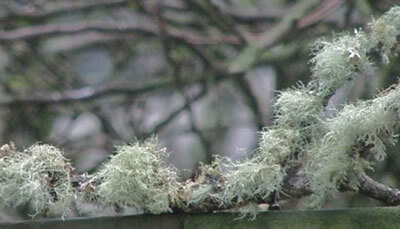 Try securing a branch or twig to the top of a railing at your bird feeding station. This one is lichen-covered and tumbled down during a storm. 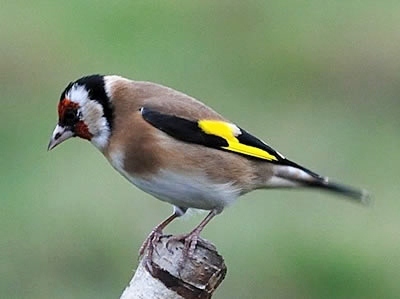 Birds usually take a cautious approach and check things out for a moment. This gives you an opportunity to take a couple of photographs. 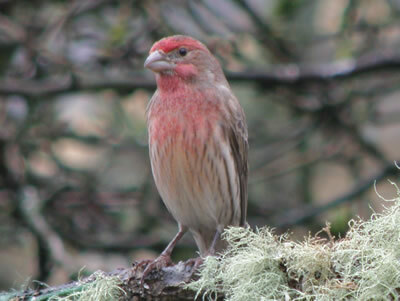 This House Finch posed on the branch within an hour of it being secured on the railing. 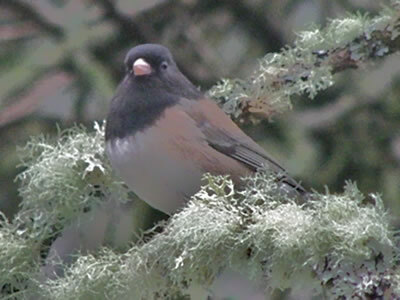 While the House Finch landed on the left end of the prop, this junco settled on the other end. The resulting photographs are great improvements over having the birds sitting on a railing. Alabama Red-bellied Turtle; Desert Tortoise; Gopher Tortoise; Diamondback Terrapin; Three-toed Box Turtle; Snapping Turtle; Northern Black Racer; Loggerhead Sea Turtle; and Texas Horned Lizard. If you can help out with a photo of two, please let us know via e-mail. 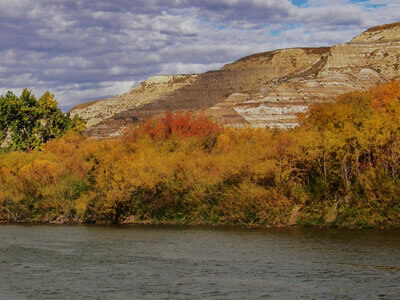 The Red Deer River flows through the Alberta badlands in this photograph taken near Drumheller, Alberta. The river starts high in the eastern Canadian Rockies and meanders across southern Alberta and into Saskatachewan where it flows into the South Saakatchewan River. The Red Deer has a length of 450 miles/725 km. 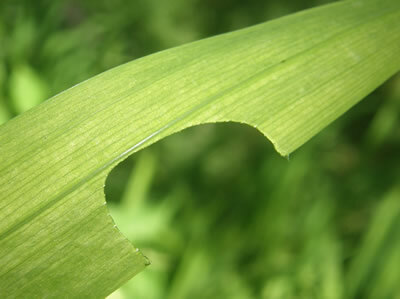 Did you know that these circular cuts on leaves are made by bees? take the pieces of leaf for nest building. 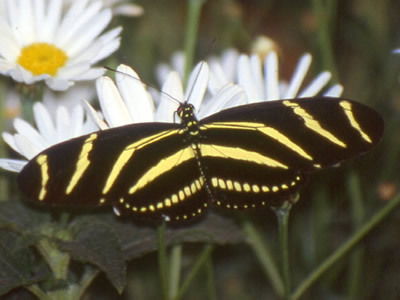 Florida's state butterfly is the Zebra Longwing, Heliconius charithona. 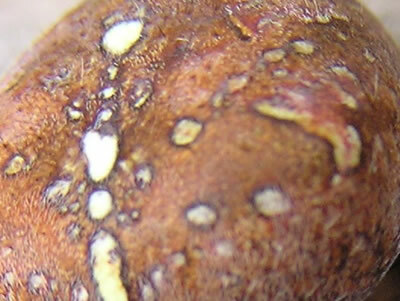 It is a common insect in the southeast US and can live to a ripe-old age of three months. 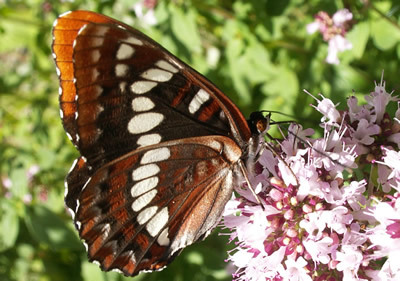 No Canadian provinces have selected offical butterflies (yet) but 19 American states have. To see our collection, just click here. 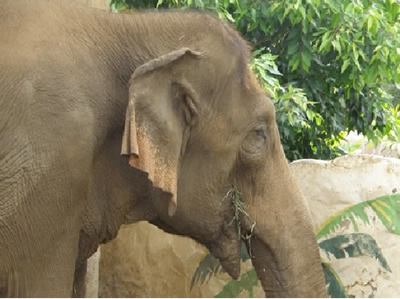 The elephant is the only mammal that is unable to jump. sadly you were incorrect. 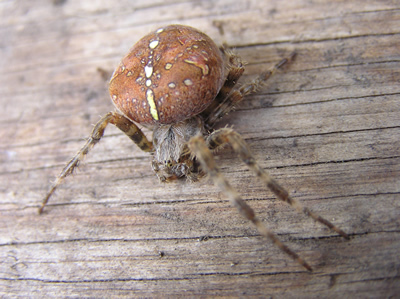 It's a Shamrock Orb-weaver Spider, Araneus trifolium. Watch for the next issue of Whispers in your inbox during the first week of November. See you then!